A magnificent Christmas gift for those you hold dear, this fabulous customized family name frame features your family name and up to 12 first names. Celebrate the most important people in your life with a treasured family photo, displayed in the perfect personalized picture frame! This engraved frame features the family last name you choose plus up to 12 names for family members, all set in a alternating pattern across the entire wooden frame surface. You can be sure that everyone in your family is included, and you can be sure this frame is unique to your family! 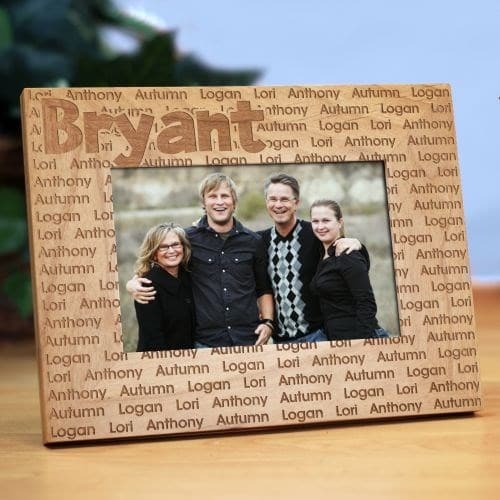 This personalized photo frame, no matter what size you choose, is perfect for a family reunion photo (maybe you order one for everyone in the group! ), a yearly professional family portrait (great as a Christmas gift), as a gift to yourself or a gift to another loved one (or many loved ones!). It is easy to personalize this clever engraved wooden photo frame from GiftsForYouNow – simply select your desired frame size from the drop down menu (choose from 4×6, 5×7 or 8×10) and in the box labeled “Family Name”, you can enter the Last Name you’d like to be shown in large font in the top left corner of the frame. Then you can further customize your personalized photo frame gift by entering all of the names you’d like to appear engraved on the frame in the order you’d prefer, with the spelling and capitalization you require. Enter one, two, ten or twelve names – the choice is yours! This personalized gift will be treasured for years to come, and you know it will be exactly how you like it with the personalization you choose.